Naples is one of the world's greatest cultural centers, filled with extraordinary works of art and architecture in the classical Greek and Roman styles. 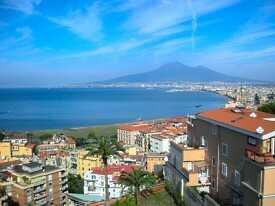 Several interesting tours are available of the city itself and the fascinating places that lie just outside of Naples. While you're in the area, you'll want to visit Pompeii, one of the most famous excavation sites in the world. Take a short boat trip to the entrancing Isle of Capri, and explore Capri Town. Wander its quaint streets and explore its shops and cafés. Or, take a ride up the Amalfi Coast. With its ocean views and beautiful vistas, it's one of the most breathtaking stretches of road in the world. Walk around and spend an afternoon getting to know the picturesque city of Naples.